And after Egghead Round the Med here comes another new game for an old platform which has made it into my top ten games of the noughties. Joe Gunn, an indie title by Endurion published for the Commodore 64 in 2007, is a brilliant retro-style platform arcade-adventure and the first Commodore game in a long time to make fans of other 8-bit machines green with envy. The player takes control of the eponymous hero who must explore the 70 rooms of the pyramid tomb of the Crocodile King which he has happened to stumble across (oh yeah, Joe’s the accidental Indiana Jones!) and whose puzzles he must solve in order to escape alive. Gameplay is a mixture of platform gaming and puzzle-solving. Our hero can make running jumps, grab and clamber-onto platforms, search skeletons (there are a lot of skeletons lying around the tomb which can hardly be doing much for Joe’s morale) and other background objects for useful items and use these items elsewhere or manipulate features to try and solve the various conundrums the Crocodile King has protected his pyramid with. Despite the fact that Joe can perform quite a few actions these are all cleverly and easily carried-out using a standard one-button joystick. Presentation is well above-par with the designers opting to use a sensible mixture of high-resolution attribute-based graphics for the backgrounds and low-resolution full-colour mode for the sprites. 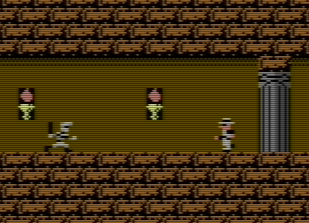 The general look and feel of the game has drawn favourable comparisons with the MSX classic King’s Valley (the new Spectrum conversion of which I wrote about earlier) – egyptian theme, small sprites, platforms and ladders. There’s a lack of in-game sound effects (a problem which Egghead Round the Med also suffered from) although this is compensated for by a good title tune and excellent and very atmospheric in-game music. When Joe Gunn first appeared it received widespread acclaim (and created some very pissed-off Spectrum fans, believe me, “right, who’s going to do a 128K version of this?”) and remains not only the best Commodore 64 title to have emerged in recent years but also, for me, one of the best games released in the last decade. It’s quite a tough game – the player is only given three lives and some of the monsters are pretty hard to avoid – and whilst the control setup works pretty well there will still be times when, in the heat of the action, Joe doesn’t do quite what is wanted of him, especially if playing with a joypad. Despite all that, this is an excellent title that shamelessly feels like it’s stepped out of the mid 1980s and well worth playing. The basic game is available as freeware although an enhanced commercial version for use on an original Commodore 64 has also been published on disk and cassette. Really, if you like platform games, puzzle-solving and have a soft spot for King’s Valley, the Rick Dangerous series and/or the Indian Jones films then I think it’s fair to say you’ll like this. And if, for some reason, you hate all those things then there’s still a good chance that you’ll like Joe Gunn anyway. Wotcha waiting for? This entry was posted on 3 January, 2010 at 4:25 pm and is filed under General games. You can follow any responses to this entry through the RSS 2.0 feed. You can leave a response, or trackback from your own site.